The Astronomy and Astrophysics group at Warwick started in September 2003 with the appointment of Prof Tom Marsh. We are interested in stars and planets, how they live and how they die, and the exotic physical processes that they allow us to explore. We are both an observational and theoretical group, and we make use of a wide range of ground-based telescopes, such as ESO's Very Large Telescope (VLT) in Chile and the Isaac Newton Group of telescopes (ING) in the Canary Islands, as well as space telescopes such as NASA's Chandra and ESA's XMM-Newton X-ray observatories and the Hubble Space Telescope. The objects we study are dynamic and can change within minutes, seconds and even milli-seconds. We specialise in the high-speed data acquisition and analysis techniques needed to track them. Members of the group have contributed to the development and exploitation of the ULTRACAM high-speed photometer, the Wide Angle Search for Planets project (WASP), the Next Generation Transit Survey (NGTS) and are preparing to deploy the Gravitational Wave Optical Transient Observer (GOTO) . We are also heavily involved in the development of space missions including ESA's Exoplanet missions - PLATO (launch 2024) and CHEOPS (launch 2018). 5th April 2019: An international team lead by Dr Christopher Manser has discovered a planetesimal on a 2 hour period orbiting a white dwarf using a new spectroscopic method. Published in the journal Science, the team has determined that the small body has either a high density and/or a large internal strength, like an iron-dominated planetary core fragment. The method developed in this project can be readily applied to a number of other white dwarf planetary systems, and will hopefully unveil the presence of planetesimals at these systems. The Warwick press release is here. 14 January 2019: Four stars, one circumbinary disk, four different orbital planes. 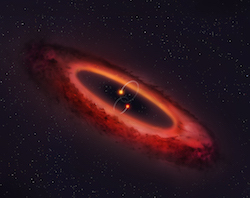 A team led by Royal Society URF Dr Grant Kennedy has discovered an unusual orbital configuration for the circumbinary disk in the HD 98800 quadruple system. In this system the disk orbits one binary pair, but at right angles to the binary orbital plane. While such "polar circumbinary" disks have been posited to exist, this discovery marks the first observational evidence, and provides a hint that planets may be able to form on such orbits. The result is published in Nature Astronomy and the Warwick press release is here. 9 January 2019: Data captured by ESA’s galaxy-mapping spacecraft Gaia have revealed for the first time how white dwarfs, the dead remnants of stars like our Sun, turn into solid carbon/oxygen spheres as the hot gas inside them cools down. This process of solidification, or crystallisation, of the material inside white dwarfs was predicted 50 years ago but it wasn’t until the arrival of Gaia that a Warwick team lead by Dr Pier-Emmanuel Tremblay were able to observe enough of these objects with such a precision to see the pattern revealing this process. The result is published in Nature. 21st October 2018: New research by a team led by Dr Farzana Meru at the University of Warwick has a way of finally telling whether newly forming planets are migrating within the disc of dust and gas that typically surrounds stars or whether they are simply staying put in the same orbit around the star. Finding real evidence that a planet is migrating (usually inwards) within such discs would help solve a number of problems that have emerged as astronomers are able to see more and more detail within protoplanetary discs. In particular it might provide a simple explanation for a range of strange patterns and disturbances that astronomers are beginning to identify within these discs. 18 October 2018: Dr. Pier-Emmanuel Tremblay is the principal investigator of a team that has been awarded a Large International Time Program with a total of 50 nights to observe at the various telescopes of Observatorios de Canarias (La Palma, Spain) in 2018/2019. The group of researchers including 10 staff, postdocs, and PhD students from Warwick will be using the GTC, WHT, INT, TNG, Mercator, and LT telescopes for observing white dwarfs within 40 pc of the Sun. This sample will be used to understand the formation and evolution of the Milky Way. 7 March 2018: Andrew Levan has been honoured in the inaugural Blavatnik Awards in the UK in a ceremony at the Victoria and Albert Museum in London. As one of three honourees across the breadth of Physical Sciences and Engineering, he is recognised for his role as a world leader in studies of the Universe using gamma-ray bursts and supernovae. The prize, presented by Sir Leonard Blavatnik is aimed at recognising outstanding research carried out by individuals under the age of 42. At 38, Andrew was the youngest honoree in Physical Sciences. Read the Warwick press release and more information on the Blavatnik Awards. 16 November 2017: Warwick Astronomers have joined the Sloan Digital Sky Survey (SDSS-V), making Warwick the first UK institution to be formally part of the project. Within SDSS-V, Boris Gaensicke will lead a spectroscopic survey of all stars within 100pc of the Earth - encompassing 350,000 systems, many of which are likely to host planetary systems. Read the Warwick press release and more information on SDSS-V.
16 October 2017: Warwick Astronomers have led observations to capture the light from a gravitational wave source for the first time. The source was the merger of two neutron stars and the observations reveal such mergers to be the origins of heavy element formation in the Universe. The Warwick press release is here, with further information in the BBC, ESO, NASA, Independent and Telegraph coverage, among others. 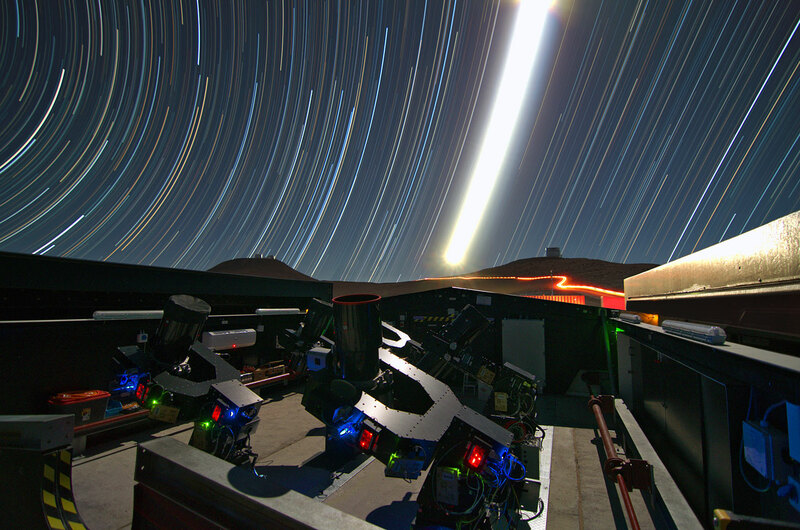 3 July 2017: Two telescopes were inaugurated at our La Palma Observatory facility. The Gravitational Wave Optical Transient Observer (GOTO) is searching for optical counterparts to gravitational wave sources and the Warwick 1m telescope (W1m) is a robotic telescope with a dual-arm imaging camera for follow-up observations. 29 June 2017: The Astronomy and Astrophysics group have had another extremely successful round of applications for time on the Hubble Space Telescope, securing a total of 8 programmes in the recent Cycle 25 competition. Prof Boris Gaensicke will lead two programmes, one looking at the fates of planetary systems around stars very different to the Sun, and another investigating novae explosions. Prof Andrew Levan will lead 3 programmes, searching for counterparts to gravitational wave sources, mapping the regions around neutron stars with extreme magnetic fields, and investigating the link between gamma-ray bursts and extremely luminous supernovae. Three of our PhD students also been awarded time, Chris Manser will investigate the nature of debris discs around white dwarfs, Anna Pala will conduct detailed studies of a unique cataclysmic variable, and David Wilson will investigate the nature of stars that have survived orbiting inside each other's atmospheres. 01 October 2016: The Department of Physics at the University of Warwick, UK, seeks to appoint up to three academic posts in the area of Exoplanets, see the job add on jobs.ac.uk or on the AAS job register. 30 August 2016: The solar system could be thrown into disaster when the sun dies if the mysterious ‘Planet Nine’ exists, according to research from the University of Warwick.Dr Dimitri Veras in the Department of Physics has discovered that the presence of Planet Nine – the hypothetical planet which may exist in the outer Solar System - could cause the elimination of at least one of the giant planets after the sun dies, hurling them out into interstellar space through a sort of ‘pinball’ effect. Read the press release and the paper on arXiv. 27 July 2016: A Warwick-led study published in Nature presents the discovery of a pulsar- like white dwarf binary. The system, which is known as AR Sco, emitts across the whole electromagnetic spectrum, all the while pulsing intensely on a two minute period. Read the press release, the paper on ArXiV or see the movie (and more). Image credit: Mark Garlick/University of Warwick. 25-29 July 2016: EuroWD16. The University of Warwick will host the 20th European White Dwarf Workshop. This meeting cover the structure and evolution of white dwarfs, as well as a wide range of astrophysical problems in which white dwarfs play a central role, such as SN Ia progenitors, the local star formation history, and evolved planetary systems. 7 Jan 2016: Out-of-Town RAS Meeting "The future of Astronomy and Planetary Science in the Ultraviolet". The University of Warwick will host an RAS 'Out of Town' meeting on Thursday 7th January 2016. This meeting will be on current UK research at Ultraviolet wavelengths, covering both planetary science remote sensing and astrophysics topics. 15 Dec 2015: Dr. Pier-Emmanuel Tremblay, Assistant Professor in Warwick, has been awarded a 1.5 million Euro Starting Grant from the European Research Council (ERC). The research project entitled "Evolution of white dwarfs with 3D model atmospheres" will soon recruit 1 PDRA and 3 PhD students to work on theoretical aspects of white dwarf research, in close connection with the observational work currently accomplished within the Warwick astronomy group. 11 Nov 2015: Astronomers from Warwick University have captured for the first time and image of an asteroid being ripped apart by a dead star and forming a glowing debris ring. Read the Warwick press release, and the preprint from ArXiv. Image credit: Mark Garlick/University of Warwick. 25 June 2015: Published in the journal Nature, a team including Warwick astronomer Peter Wheatley has discovered a giant comet-like tail of hydogren gas evaporating from a Neptune-sized exoplanet. The gas is thought to be boiled off by X-rays from the parent star and then swept away by radiation pressure. The tail was revealed in Hubble Space Telescope observations in which 56% of the star is covered by the tail in ultraviolet light. The planet is losing its atmosphere at a rate of 1000 metric tonnes per second, having narrowly escaped total evaporation by the intense X-ray irradiation it suffered when its parent star was young and active. Read the Warwick press release, the full journal article in Nature, or the preprint from ArXiv. Image credit: Mark Garlick/University of Warwick. See for example coverage by the Washington Post, and the Daily Mail. 24 June 2015: The Warwick astronomy group has been very successful in the latest round of time allocation on the Hubble Space Telescope, and will lead six projects in the forthcoming Cycle 23, including a 67-orbit GO program and a 75-orbit snapshot program: Boris Gänsicke (An HST legacy ultraviolet spectroscopic survey of the 13pc white dwarf sample and The frequency and chemical composition of rocky planetary debris around young white dwarfs: Plugging the last gaps), Mark Hollands (The dawn of rocky planet formation), Andrew Levan (The late time behaviour and environments of the first gravitational wave transients), Chris Manser (A highly dynamical debris disc in an evolved planetary system) and Elizabeth Stanway (Understanding the star formation environment of a very low redshift, low luminosity, long Gamma Ray Burst). These observations were facing an oversubscription of approximately six to one. 7 May 2015: A research team led by Warwick astronomers Roberto Raddi and Boris Gänsicke have found that water delivery via asteroids or comets is likely taking place in many other planetary systems, just as it happened on Earth. Read the Warwick press release and the paper in the Monthly Notices of the Royal Astronomical Society. Read more in press releases from ESO and Warwick. See also regional BBC News coverage. 08 August 2014: A research team led by Warwick astronomers Joe Lyman and Andrew Levan have investigated the locations of peculiar 'calcium-rich' supernovae, which are often seen to explode at huge distances from any nearby galaxy. They postulate the merger of white dwarf-neutron star binary systems 'kicked' from their galaxy may explain these remote locations. The Warwick press release can be found here.